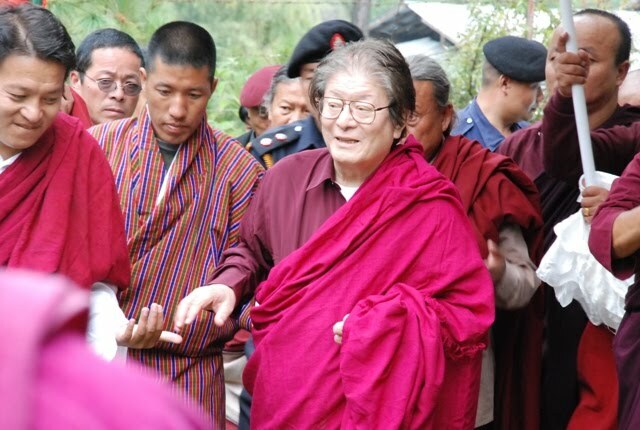 Word is spreading of the passing of Dungse Thinley Norbu Rinpoche, eldest son of His Holiness Dudjom Rinpoche, and incomparable scholar and contemporary Nyingma master. He was an incarnation of Tulku Trimé Özer, who was one of seven sons of Dudjom Lingpa, and was also considered to be an emanation of Longchenpa. Our lord protector His Holiness Kyabje Dungse Thinley Norbu Rinpoche passed into parinirvana last night. Rinpoche wrote down a message for all of us, asking that everyone do Vajrasattva practice for three weeks. These were Rinpoche’s last vajra words for us. If you are able to join with sangha and do practice in your area with a lama, please do that. If possible, please join with our sangha at Pema Osel Ling to do the Dorsem Lama Chopa, at Kunzang Gatshal, or with your local sangha. If you are not able to do that or if there is no local sangha, it is fine to do any form of Vajrasattva practice according to any sadhana including Ngondro and the Hundred Syllable Mantra. Meditate that our lord protector Dungse Rinpoche is inseparable with Vajrasattva’s form. Meditating this way, take empowerment and receive blessings. Then as Vajrasattva dissolves into you, you become inseparable with Vajrasattva. Rest in formless meditation in this way, with your mind and Kyabje Dungse Rinpoche’s wisdom mind inseparable. This is the best way for us to get a taste of Kyabje Dungse Rinpoche’s wisdom mind, even though Rinpoche is not physically present. This stays with us inseparably until we reach enlightenment. Receiving Rinpoche’s blessings in this way is most essential. Now in particular, after Rinpoche’s wisdom mind has been uncovered from the physical elements and has merged with the vast dharmakaya, receiving Rinpoche’s blessings is more powerful even than when Rinpoche is alive. Rinpoche’s wisdom mind merges and pervades everywhere. Please do Vajrasattva practice every day. This is a very special opportunity to receive Kyabje Dungse Rinpoche’s blessings. We have heard that Thinley Norbu Rinpoche passed away. Therefore, at all the centers students should gather if they can and practice Dorsem Lama Chodpa–the practice of making offerings to the guru as Vajrasattva. Individually, students should recite Vajrasattva mantra as much as they can. Why should everyone do Vajrasattva at such a time? Whether or not the lama who passed away needs purification, we have no way of knowing. But when a great master passes, the power of merit accumulated at such a time is said to be increased even 100,000 times. Therefore, since we all need to purify our obscurations and accumulate merit, we can use the Lama Chodpa (practice of offering to the guru) as the method to engage our three doors in virtue at that time. Engaging our body, speech, and mind in such powerful virtue purifies the negativity that we constantly use them for out of habit. And we all have connection to this lama, the son of His Holiness Dudjom Rinpoche, so therefore we need to practice now. There is a special blessing and power to practices done at such a time with faith and devotion–the merit gathered and the negativity purified are truly inconceivable. This is because of the enlightened intent of such a master, whose every act is only to bring benefit to all beings. Such masters are not ordinary like ourselves. They don’t die like we do, powerless and sniveling. They are born into this world as an act of compassion, as long as their physical body endures they use it only to bring benefit, and then they pass away and again teach the truth of impermanence just as Buddha Shakyamuni did. Therefore their passing, too, is part of their enlightened display, their miraculous activity in this world. That is why there is such power and blessing at their seeming ‘death.’ We should not think, “Oh, I’m so sorry that this lama is dead.” Instead, we should feel faith and devotion and appreciate that we personally have such an opportunity for powerful practice. We shouldn’t think, “Oh, it is just tradition to practice when a lama passes.” It is more than just a tradition; it is an opportunity to take advantage of the exceptional blessing of that time. Also, traditionally you might go and offer katags and other offerings, and maybe you can’t do that now, but always you can make the offering of practice. That is a real offering, and you don’t have to go anywhere to make it. We also shouldn’t think, “This was not my lama.” In fact, when any great lama of any tradition passes away there is this same opportunity. We can always do the Lama Chodpa practices at such a time. Gelug, Sakya, Kagyu, Nyingma–it makes no difference what school of Buddhism the master taught or practiced. We also should not think that there is no blessing for us if we never met that master in this life. When you do the Lama Chodpa, you are offering to all gurus, all yidams, all dakinis. You should think in a vast way like this when you practice, don’t be narrow or rigid thinking that it is only one way. A true guru encompasses all the three roots–all guru manifestations, all yidams, all dakinis. You don’t have to do the Lama Chodpa only for a lama, or only at their passing. We always need to gather merit, because we are always exhausting our merit. We always need to purify negativity, because we are always so busy making more negativity. Therefore see this as an opportunity to practice, a time of blessing and guru devotion, and do as much Vajrasattva as you can–a little bit here and there continuously. It will be of great benefit.